Yeah, in recent years, we are used to holding a mobile entertainment center in our hands, but why limit your fun to a tiny smartphone screen or a slightly larger tablet or laptop display? It is even better to sling video pushes the contents of your small screen — from an app, or as a mirror of the entire screen — wirelessly onto your TV. For those who would like to stream movies from a Mobile Device or Computer to TV, the following ways can probably satisfy you. Nearly all smartphones and tablets can plug into an HDMI-ready TV. One cable end plugs into your phone or tablet while the other plugs into the HDMI port on your TV. Once connected, whatever you display on your phone will also show up on your TV. You can check out pictures, watch video, surf the web, use apps and play games on your big screen. Top reason to connect: It's super simple—just one cable to connect. There's no Wi-Fi connection or password. Consider this: Most HDMI cables are 15 feet or shorter, but you can find some as long as 65 feet. The longer the better if you're sitting on a couch that's on the other end of a spacious entertainment room. If cords are not your thing, get a gadget that plugs into your TV, connects to your home Wi-Fi and communicates between your phone and TV. Apple offers AirPlay to connect its devices to your television using the company's Apple TV set-top boxes (from $69 to $199). Android and Windows device users have several options, including the $35 Google Chromecast, and receivers and smart TVs running either Google's Android TV or one of two technologies called WiDi and Miracast. Roku's video streamers (ranging from $50 to $130) and Amazon's Fire TV devices (from $40 to $100) offer limited slinging capabilities, as do game consoles. 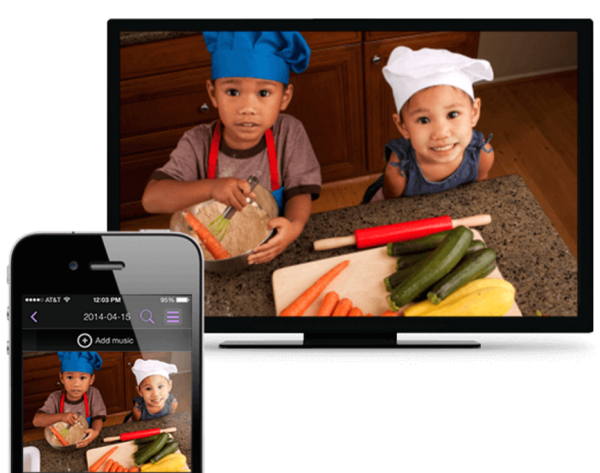 How Do I Use Roku To Stream Video From A Mobile Device To A TV? The $50 Roku Streaming Stick, as well as the $50 Roku 1, $70 Roku 2, $100 Roku 3 and $130 Roku 4 boxes, work with apps for iOS or Android mobile devices (but not computers). Roku's free app acts as both a remote control for the set-top box and a slinging tool. By selecting the top-right-corner menu, you will find a Play On Roku option. This allows you to send videos, photos and music that reside on your phone or tablet to your TV. This works with all current Roku players and Roku TVs. You can also play Web video from compatible mobile apps, which, currently, are those from YouTube and Netflix. When you open the YouTube app, for example, a beaming icon on top allows you to connect to the Roku box and play videos via the box on your TV. Anything you choose on the phone is then played on the big screen, using the same technology as the Chromecast employs to sync video. Roku has introduced Miracast/WiDi capabilities as a beta feature with its Roku 2, Roku 3, Roku 4 and Roku Streaming Stick devices running software version 5.6.60 or later, as well as for Roku TVs made by various companies such as Hisense and Sharp. (If you need to upgrade, simply access the main menu and select System Update.) Simply use standard Miracast/WiDi instructions to screen mirror with your Android, Windows 8 Phone or Windows 8.1 or later PC. If you want to ensure that the protocol is turned on, access the main menu and navigate to screen mirroring (beta). Click on the option, and make sure that Enable Screen Mirroring is checked. If you want to disable the protocol, select Disable Screen Mirroring. 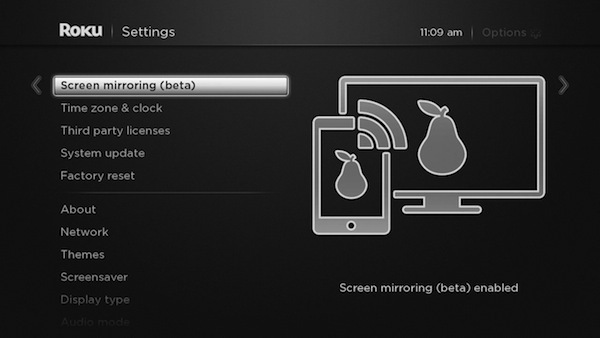 As long as screen mirroring is enabled, your Roku will work in exactly the same way as any other Miracast receiver. How Do I Use Miracast Or WiDi To Stream Video from Android/PC to TV? 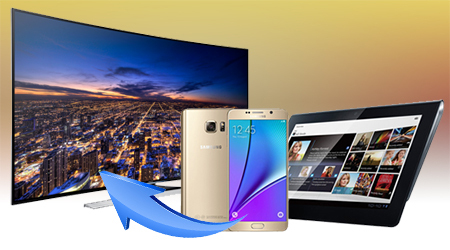 Check out Miracast, which lets you stream your stuff with your home Wi-Fi. It's compatible with Windows Phone and Androids with 4.2 Jelly Bean or later, although not all Android devices can mirror your mobile screen via Miracast. Newer phones like the LG G4 can do the job. 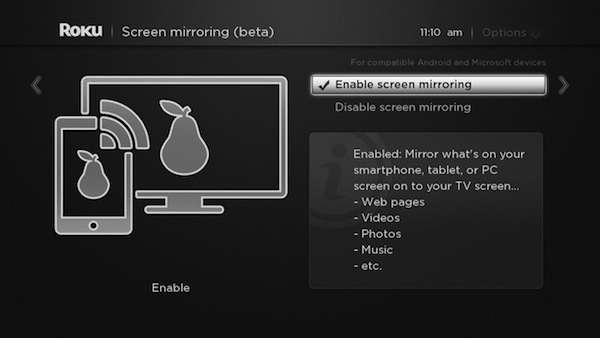 In Android 4.2 Jelly Bean (or later), go to Settings, select Display and then select an option called either Wireless Mirroring or Wireless Display. 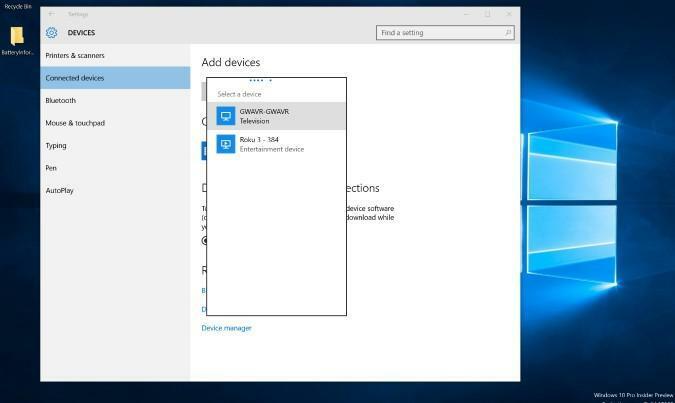 If you use a tablet with Windows 8.1 or later, including a Microsoft Surface or Surface Pro, you can also take advantage of Miracast/WiDi. Some Windows 8 and 10 Phone devices work with Miracast, too. 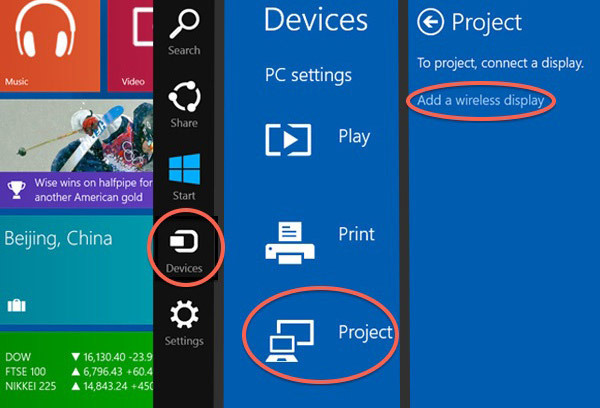 In Windows 8.1, from the Start screen, swipe from the right and click Devices, and then select Project. Tap "Add a wireless display," and select the WiDi receiver to broadcast your screen. 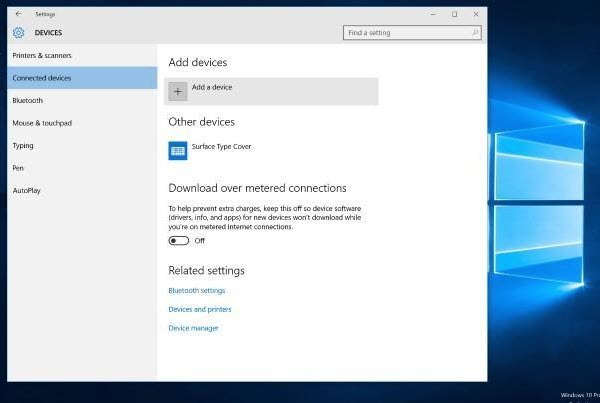 In Windows 10, click on the Start menu, and type Connected Device Settings into the search box. Then, click Add A Device and select your WiDi receiver. How Do I Use Airplay To Stream Video from Apple Computer, iPhone, iPad or iPod Touch to TV? Computers: You'll need a Mac built in late 2011 or later and an OS X Mountain Lion (10.8) or later operating system. To check when your Mac was built, go to About This Mac under the Apple menu in the upper-left corner of the screen, and click More Info. Mobile devices: You'll need an iPhone 4S, iPad 2 or iPod touch (5th generation) or later, and iOS 5 or later. Operating systems are often easy to upgrade. But if your hardware is too old, you'll need to use Chromecast instead, as it has much lower minimum requirements — other than an HDMI port on your TV. You'll need an Apple TV set-top box ($69 to $199) connected to your television via HDMI. Both the Apple TV and your mobile device must be on the same Wi-Fi network. 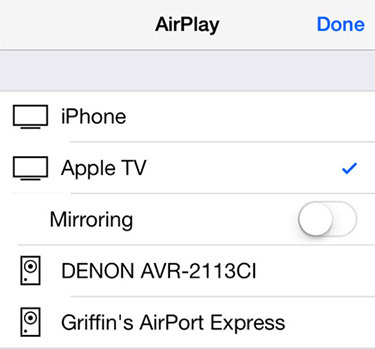 To enable AirPlay mirroring in iOS 7 and later, swipe up from the bottom of the screen to access the Control Center. (On iOS versions 5 or 6, double-tap the home button; then scroll all the way to the left.) Tap the AirPlay icon, which looks like a triangle pointing up to a screen, and then select your Apple TV. An option for mirroring will appear. After you enable mirroring, your screen will also appear on the HDTV that the Apple TV is connected to. Some apps also take advantage of AirPlay to turn the mobile device into a controller while a video or game displays on the big screen. To use this feature, look for the AirPlay icon within the app instead of using Control Center. If your Mac and Apple TV are on the same Wi-Fi network, an AirPlay icon will appear on the top right of your screen, near the clock and icons for items such as battery level and Wi-Fi status. Just click on the AirPlay icon to activate mirroring. If you are running Mountain Lion or later and don't see the icon, your hardware is too old to support AirPlay. How Do I Use Google Chromecast To Stream Video from Android To TV? If your devices don't support AirPlay or Miracast, Google offers two options. Its $35 Chromecast dongle is the easiest solution, but its Android TV set-top boxes, such as the $99 Nexus Player, as well as Android TV-equipped smart TVs like Sony's new models, offer the same capabilities. 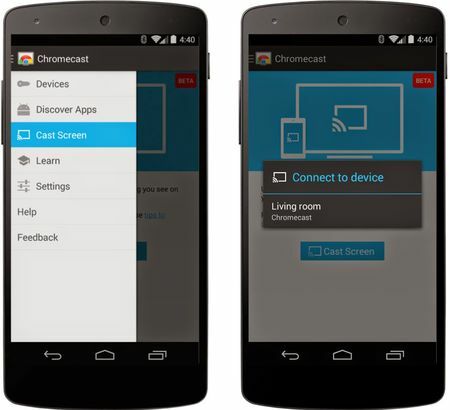 Chromecast and Android TV devices stream content directly from newer Android mobile devices. To mirror content, open the Chromecast app, select Cast Screen from the app's navigation drawer and select your Chromecast device. 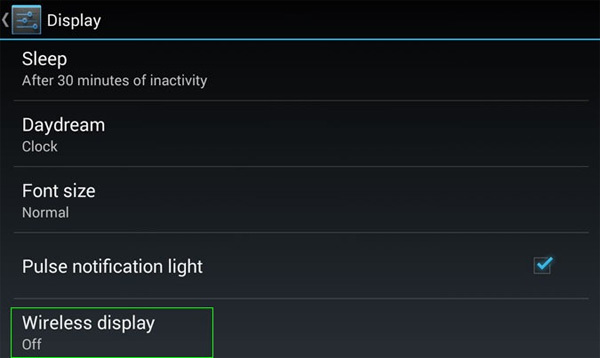 If you have a Google Nexus phone or tablet, you can also access this feature through the quick settings menu. Chromecast functions are also built into more than 1,000 apps, such as YouTube, Netflix and HBO Go. Rather than beaming video from the mobile device to Chromecast or an Android TV device, the apps instruct the device to go online and access the same content that the apps are playing, synchronized to the same point in the video. This provides a kind of screen casting for older Android devices that don't support mirroring, as well as for iOS devices. 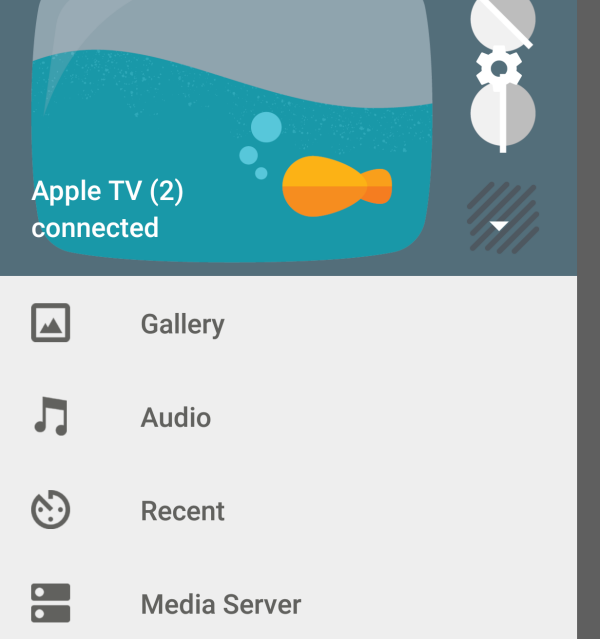 Based on the DIAL (Discovery and Launch) protocol, a Chromecast-enabled mobile app looks for a Chromecast or Android TV on your network and establishes a connection. Tap the Cast icon to play the video on the big screen. 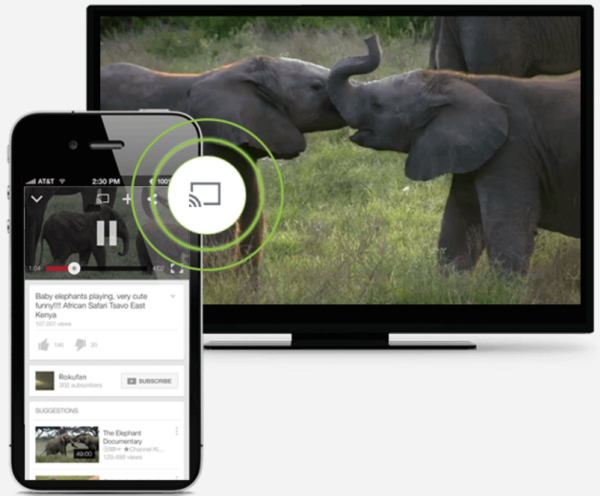 After your mobile device helps synchronize the Chromecast/Android TV and video content, the app turns into a controller so you can pause or rewind playback. 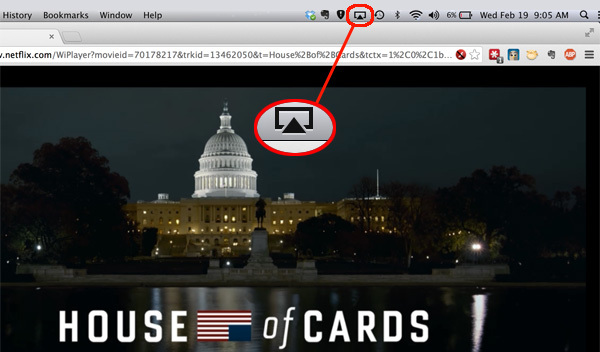 If the content you want to send to your TV is visible in a Web browser on your computer, such as a YouTube video or Netflix streaming, you can use Chromecast or Android TV with a Mac or a PC (no AirPlay or Miracast required). 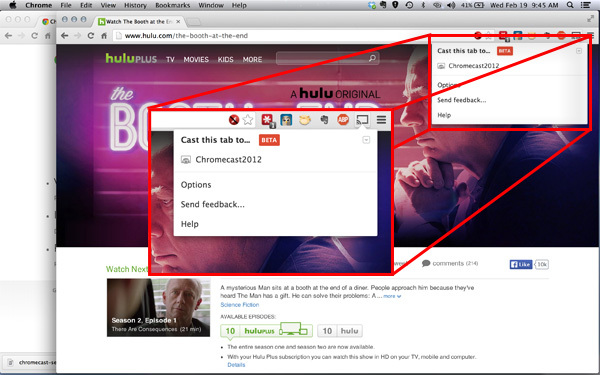 To cast a tab, click the Cast icon, which appears to the right of the Chrome browser's address bar, and select your Chromecast device. After a few seconds, the contents of the tab will appear on the TV. You will, however, experience a lag of a few seconds between when you do something on the computer and when it happens on the big screen. How Do I Stream Video With My Amazon Fire TV and Kindle Tablet? With a Kindle Fire HDX, select Settings, then Display and Sounds. Next, choose Display Mirroring. Much like the Apple TV approach, the HDX tablet will then pair with the Fire TV box over your Wi-Fi network. Once the connection is made, any video and audio played on your tablet will be mirrored on your TV via the Fire TV box. Consequently, you can sling not only videos, but music and photos as well. Lastly, you can beam YouTube videos to the Fire TV box from iOS and Android handheld devices. 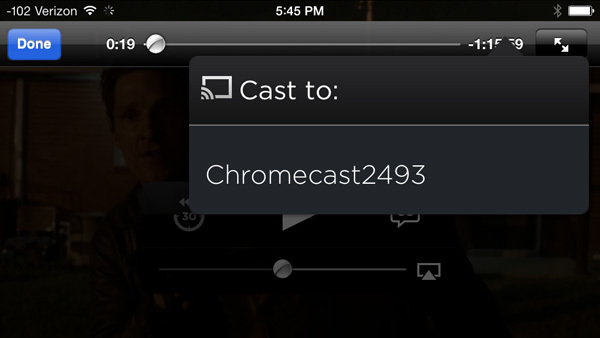 As in the processes for Roku and Chromecast, look for the beam or cast icon along the top of the screen. Tapping the icon will pull up a list of devices that the video can be cast to, including Amazon Fire TV. How Do I Stream Video To My TV Using Plex? 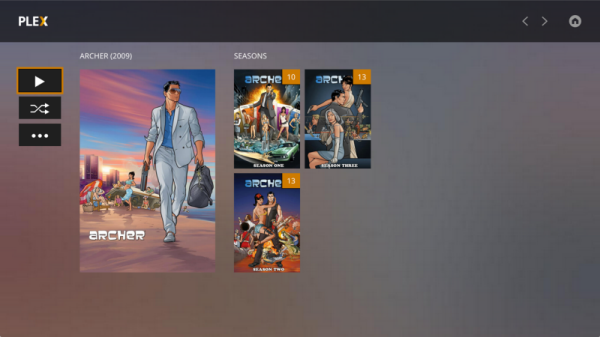 The Plex program and service ($5 per month, $40 per year or $150 for life) runs as a media server on Windows or Apple computers, and streams to a wide array of devices that connect to your TV. These include set-top boxes such as Amazon Fire TV, Chromecast, Roku, the new Apple TV, Xbox and PlayStation game consoles, and smart TVs from Samsung, Sony and Vizio. Plex will stream video files (as well as music and photos) that reside on your computer to these devices, but it doesn't stream video you play in a Web browser, such as Netflix. Fire TV, Chromecast, Roku, the new Apple TV, Xbox and PlayStation game consoles, and smart TVs from Samsung, Sony and Vizio. Plex will stream video files (as well as music and photos) that reside on your computer to these devices, but it doesn't stream video you play in a Web browser, such as Netflix. Plex, does, however, offer channels for particular networks or shows, such as PBS, Crackle or The Daily Show. These can be played on both your computer and your streaming device app, but they are not synchronized. If you are halfway through Episode 2 of Crackle's action show "Chosen" on your computer and then you go to your TV, you will have to navigate to that episode and then manually fast-forward to where you left off. What Are Other TV-Streaming Alternatives? There are several so-called casting apps on the market that beam media from your PC, phone or tablet to a TV via set-top boxes and game consoles. However, the reliability of many of these apps is questionable. Some have had support pulled from products like Chromecast, only to be restored months later. AllCast is an example of one such mobile app. It can cast content from an Android or iOS mobile device to a variety of receivers, including Chromecast, Roku, Amazon Fire TV, Xbox 360, Xbox One and even Apple TV. AllCast offers both a limited free app and an unlimited paid app ($4.99). The $10 AirParrot program can stream media from PCs and Macs to multiple devices, including several at once. Apple TV is one of the supported devices, providing a way to stream from a PC or an older Mac to an Apple TV. Top reason to connect: Streaming movies and shows directly to your TV using these gadgets couldn't be easier. The connection between them and your phone is a bonus. Consider this: There are plenty of apps that support wireless streaming, including Amazon Instant Video, Netflix, Hulu, HBO GO, YouTube and Vimeo. If you're considering a new TV, look for one that'll communicate with your phone or tablet such as one that is DLNA-certified. DLNA stands for Digital Living Network Alliance. A DLNA-certified phone such as the Samsung Galaxy S 6 or HTC One M9 can connect to a DLNA-certified TV, projector or set-top box as well as an Xbox One, when you link them to your home Wi-Fi. Top reason to connect: There's nothing between your phone and your TV. No wires and no streaming gadget required. 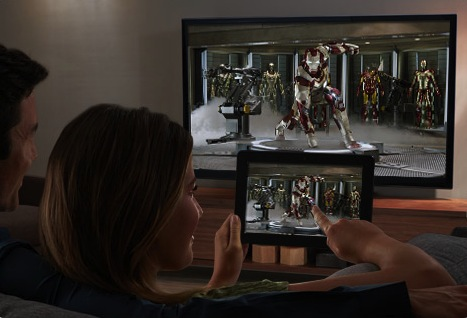 Consider this: Want to make your current TV compatible with Miracast? The Belkin Miracast Video Adapter plugs into your TV's HDMI input. That'll do the trick. What if you have lots of cherish HD and 4K Video/Movie files but your TV does not read them? What if your network is broken but you really want to watch movies through TV? What if you just feel stoned with TV and really need an user friendly program? Don't worry. Converting and transferring downloaded HD and 4K videos to TV is the most stable, reliable and easy to use way for playing any videos on TV anytime without the need of network connection. All you need is the right soft gear. iFastime Software will help you out. 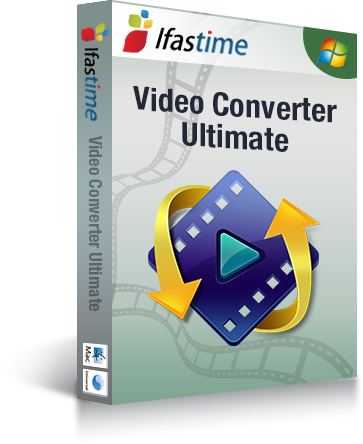 Its all-in-one iFastime Video Converter Ultimate is the best TV video converter, it supports converting downloaded HD and 4K MKV, AVI, MP4, VOB, MPG, FLV, MOV, Youtube videos, backing up AVCHD, h.265 recordings and ripping purchased Blu-ray or DVD videos to TV while still perverse high quality. In addition, encoding TV unsupported audio like FLAC, OGG, DTS etc to TV supported MP3, AAC, AC3 or WMA for streaming are also allowed. Have a try! thanks for the info. I’ve got a point something out..
Playstation VR vs Oculus Rift: Which Is Worth Buying? Sony RX100 Vs. Sony A7S Mark II: Which One to Buy as Gift?